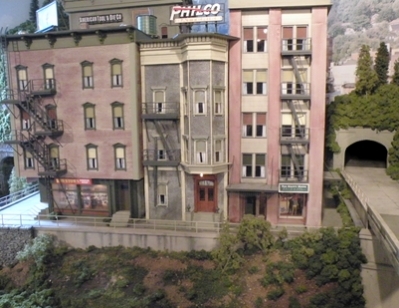 Shown here are samples of past work at a project level, in which I, my associates, and the customers collaborated to design and construct entire layouts or substantial dioramas. I don't travel as far afield now as I once did, but I can still produce scenes or dioramas which can be moved by your truck or van. Qualified staff can deliver and install structures and dioramas if needed with my direction. 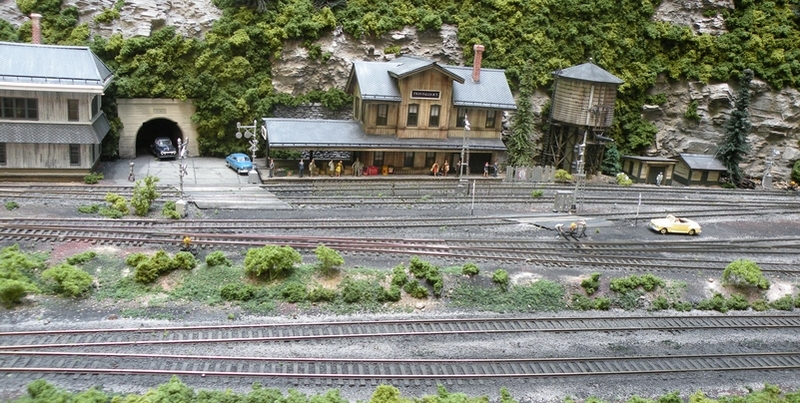 The structures at left and right above were built by me in O gauge (that's "gauge," NOT "Scale") for a customer in Boulder Co. The modern curtain wall "Otis" building at right includes interior fixtures and lighting; likewise the bottom floor of the brick building complex at left. 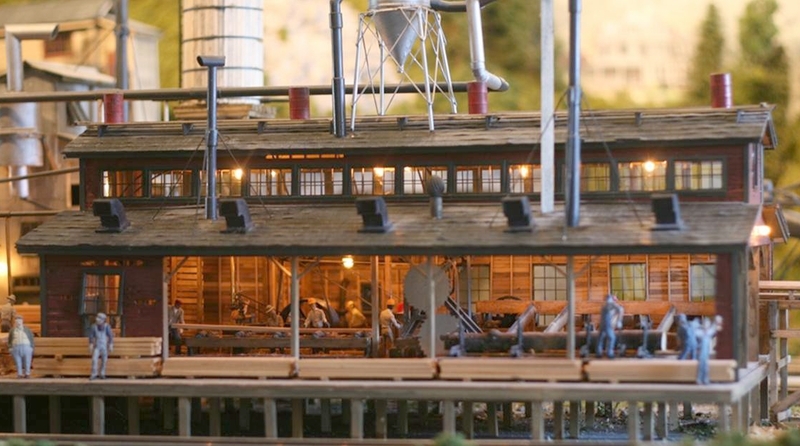 Front (top picture) and rear views of a complete operating saw mill with an overall foot print of 14” x 40”. 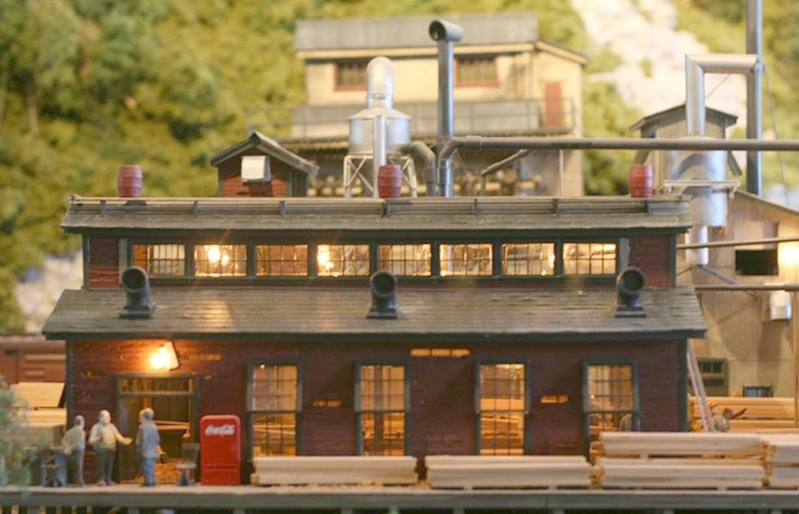 It has a full board by board interior, over 50 lights, weathered figures, complete working interior, log pond , and much more. Construction was of styrene and basswood. Over 300 hours went into this model. I can build more, and cost can work within your budget. Following are general and detail views of an HO "shelf style" layout/diorama I built for Rick Chandler, who specified a "portable pike." This northwestern setting measures 30” deep X 13’ long. It weighed less than 150 pounds and was easily loaded into a small rental truck he used to transport it. All wiring for DCC, including working turnout motors, was included. "Ready to operate!" A general view of the central portion of Rick's portable pike. It is possible for any scene to both look "good," yet also look "wrong," somehow. Thus any diorama must make sense not just in terms of realistic appearance, but also in terms of more subtle psychological cues. For example, how do the passengers on the platform get there? By motor vehicles entering through the tunnel, of course! Looking toward the east of Rick's diorama, we see more hints of reality. For example, the rock fragments ("scree") along the bottom of the concrete retaining wall will be familiar because you have seen the exact same thing along the Interstate Highway System, where the road cuts through mountains. The stones accumulate naturally over time through the impact of Mother Nature's erosive actions: water run-off, freezing and thawing. Now looking to the west, a compelling array of bridges running over a churning river lead to a bank of tunnel portals taking the trains "somewhere." Were it not for the obvious boundary at lower left, anyone might think this is a photo of an actual real place. Coniferous spires in the background and craggy rock faces are convincing. Detail study looking into the diorama from the west side depicted in previous photo. The concrete piers supporting the girder bridge above them include surface fracture lines commonly seen in the real world. Note that none of the fracture lines extend beyond the control joints in the piers. Water, water! The falls in the background feed the river running through the foreground. True to life, the thrashing cascade is reflected in the ripple lines of the river, which slightly distort the stones below the surface. 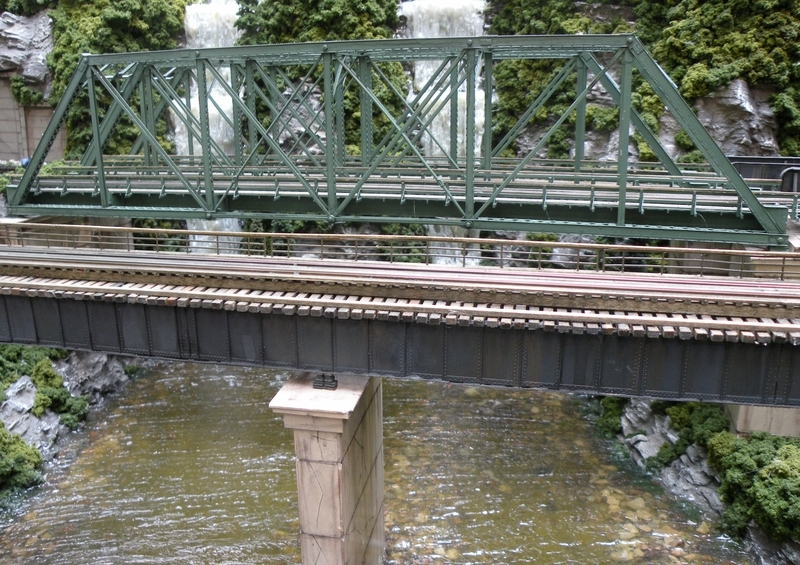 Above, well maintained bridgework crosses the gorge. 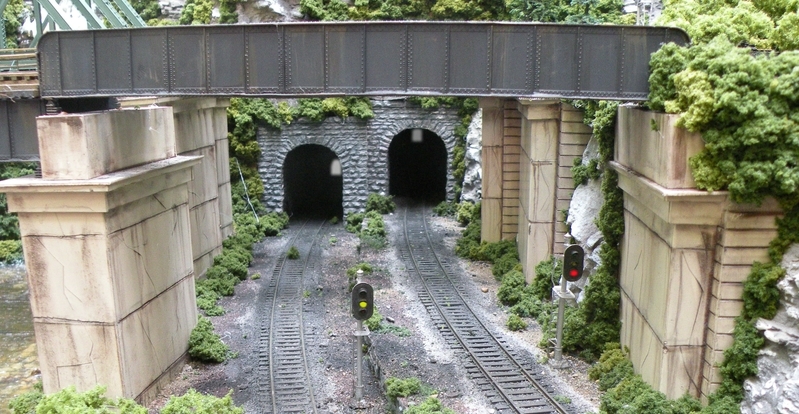 Pictured above are various scenes from a 3 rail layout I constructed in Howard County Md. Note in particular the enhancement from lighting inside and outside structures, and the current flow of the water as it approaches and then drops over the falls.